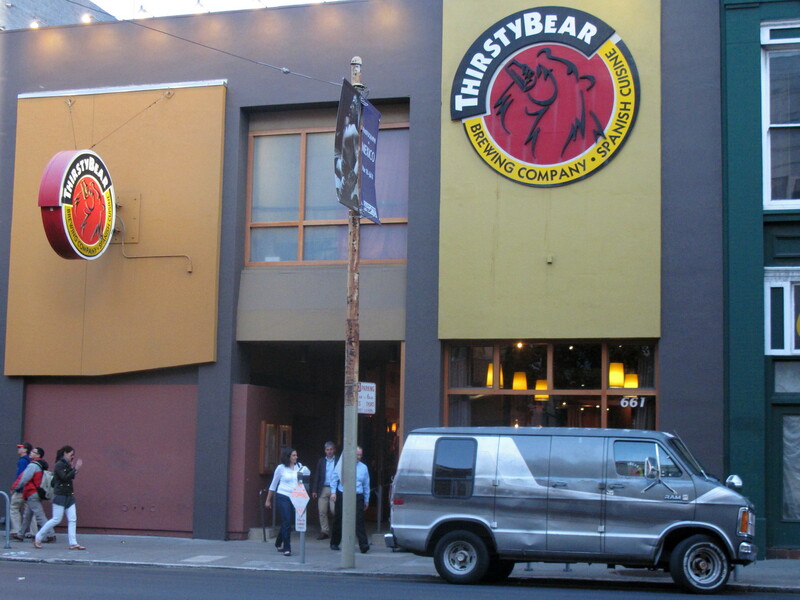 ThirstyBear Organic Brewery is a brew pub and Spanish tapas restaurant in downtown San Francisco. They make their own organic beers, keeping seven on tap and rotating in one or two seasonals. In 2009 they embarked on a modest barrel-aging program and periodically put one on tap. Small tapas plates made from sustainable and organic ingredients whenever possible are the heart of their popular menu. Extras: ThirstyBear’s brewery was certified organic in 2008, and they are a Green Certified Business. There is room upstairs for private parties. They have some TVs, but they sometimes turn down the lights and bring in the DJs or live Flamenco dancers. In 2011 they started selling pre-filled growlers of beer to go. Exit BART through the exit labeled B1. Hook around to the left at the top of the stairs and walk to New Montgomery. Turn right and walk down New Montgomery Street to its end at Howard Street. Turn right for one block, then then cross Howard and look for ThirstyBear on the left. I had the chorizo stuffed squid as an afternoon snack. A great way to tour San Francisco via BART.